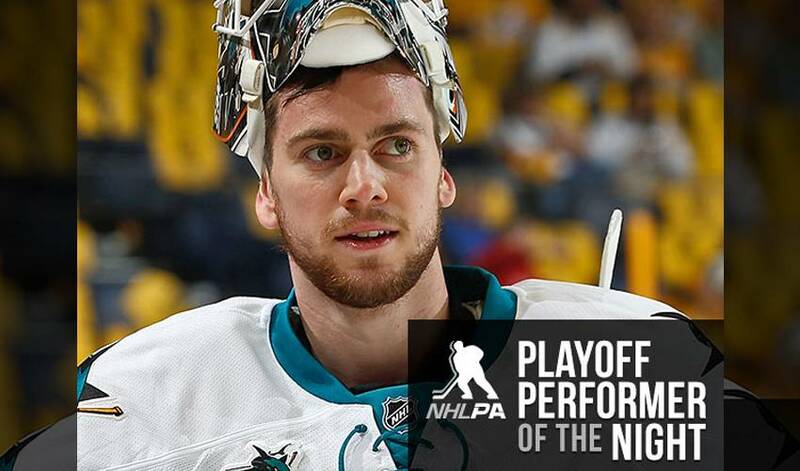 The PPOTN puck stops as here as San Jose’s Martin Jones blanked St. Louis in Game 2 of the Western Conference Final. Jones turned aside 26 shots en route to the shutout in a 4-0 Sharks road victory. STAT PACK: Jones stopped nine shots in the first period, six in the second and 11 in the third. HAPPY PLACE: Jones registered his second career postseason shutout to help the Sharks earn their third win in four visits to Scottrade Center overall in 2015-16, including victories in both regular-season matchups (Feb. 4: 3-1 W and Feb. 22: 6-3 W). I’LL SECOND THAT: Jones, who recorded his first playoff shutout in Game 7 of the Second Round vs. NSH (20 SV), became the second goaltender in Sharks history to post multiple clean sheets in a single playoff year (also Evgeni Nabokov: 3 in 2004). HOCKEY DAD: Jones’ father, Harvey, is the VP of Construction for the Vancouver Canucks. BLOW OUT THE CANDLES: Jones shares a birthday (January 10) with singer Rod Stewart and boxing legend George Foreman. HONOURABLE MENTIONS: Brent Burns had a pair of goals for the Sharks. Logan Couture had two assists, and Dainius Zubrus chipped in with a goal and an assist.